14 tracks: Catherine-Ann MacPhee - Canan Nan Gaidheal * Lynn Morrison - Hush, Hush * Karine Polwart (with Malinky) - Whaur Dae Ye Lie? * Karen Matheson (with The ScottishPower Pipe Band) - Amazing Grace (Gaelic Psalm version) * Isla St Clair - Lament For The Commandos / Dunkirk * Ishbel MacAskill - Soraidh Leis An Ait (Farewell To The Place) * Heather Heywood - MacCrimmon’s Lament (MacCrimmon’s Sweetheart) * Alyth McCormack (from The Captain’s Collection) - Braighe Loch Iall (The Braes of Lochiel) * Sheena Wellington - Ae Fond Kiss * Mairi Campbell (with Jack Evans) - Both Sides The Tweed * Mairi MacInnes - Fear A Bhata * Alison McMorland - Time Wears Awa * Margaret Stewart with Allan MacDonald - I Ho Ro’s Na Hug O Ro Eile (A Love Song) * Gill Bowman - Auld Lang Syne. Songs by female vocalists from the Greentrax back catalogue. 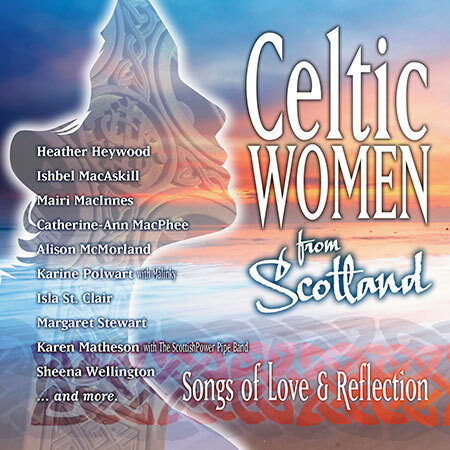 Each song has the theme of love and reflection, resulting in an album of very powerful songs, old and new, superbly interpreted by some of Scotland’s finest Gaelic and Scots women singers. From Cathy-Ann MacPhee’s stunning version of the Gaelic rallying song Canan Nan Gaidheal, to Gill Bowman’s version of Auld Lang Syne (set to the original Burns melody), this album is full of gems.